Today is my husband's 40th birthday. I had intended to do something really grand for him, but it didn't work out. See, I got sick back in January. I found out that I was having a particularly severe allergy season as the temps here would go from the 40's to the 70's through out January and February causing everything to bloom at once. Lucky me, I now have an inhaler just to help me breathe. That is in addition to the two other allergy meds I take now. Right at the end of February I started catching a cold from my youngest and it quickly spread through the entire family. I had only hoped that it was just more allergies, but it turned out not to be. On top of that, a good friend passed away on Feb. 29th after a five year battle with cancer. Passing of friend trumps everything else and we put a lot of things on hold so I could attend her funeral yesterday. Hubby, girls and I all went to the wake but he kept the girls since we are all down with this cold now. I'm glad my husband understands the need for me to go to the funeral instead of having a little extra time with him. He didn't even hesitate when I said I needed to go, which is why I married him to begin with. I did try to squeeze in a few fun things for him. 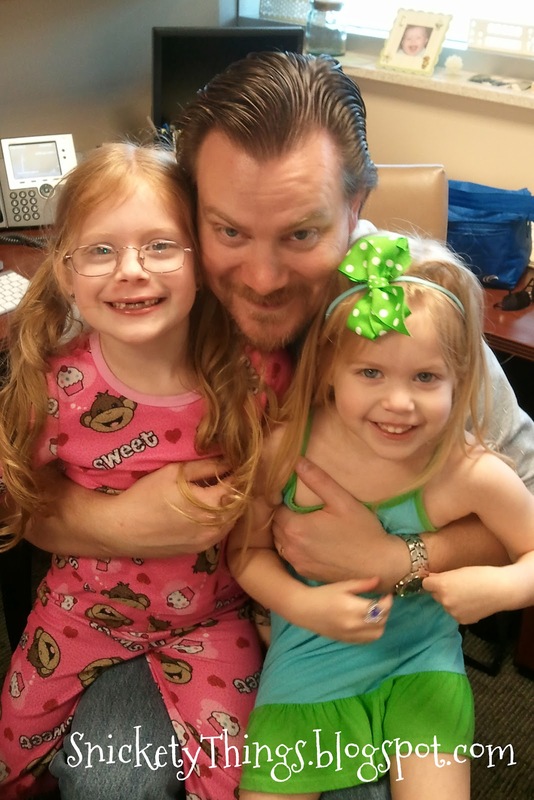 I took the girls up to his work on Friday. My oldest is in pajamas because they had a fun day at school for Dr. Seuss' birthday. They got to take a pillow and blanket to school, too. 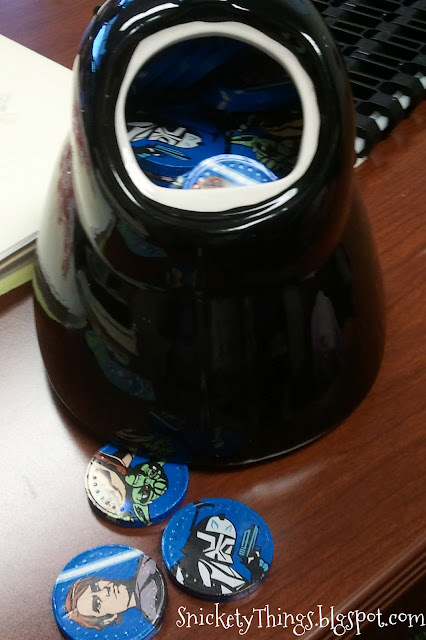 While they distracted him I filled his candy jar with chocolate Star Wars coins I got on clearance after Christmas from Walmart. 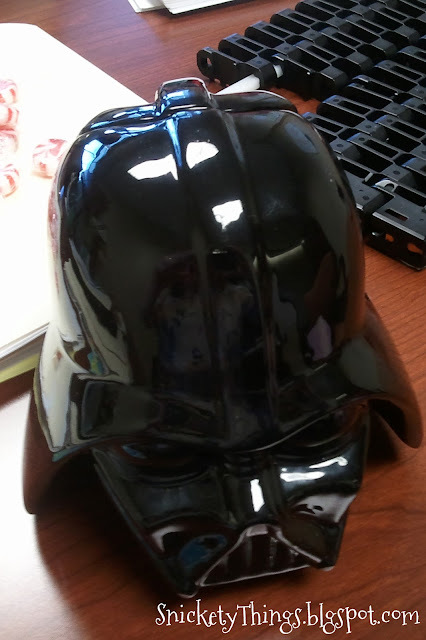 We had gotten him the cool little Darth Vader Candy Jar at Christmas. Last night I made him some stickers for candy because he liked the ones I did for our niece. Aside from Star Wars his favorite thing is Batman, so I did the stickers in that theme using a mixed bag of Reeses cups, Rolos and Kisses. I couldn't do them until after I got off work yesterday evening so he watched me put all the stickers on as we watched a movie. So much for the surprise of it all. I used 25 different bat symbols spanning the life of the Batman series. 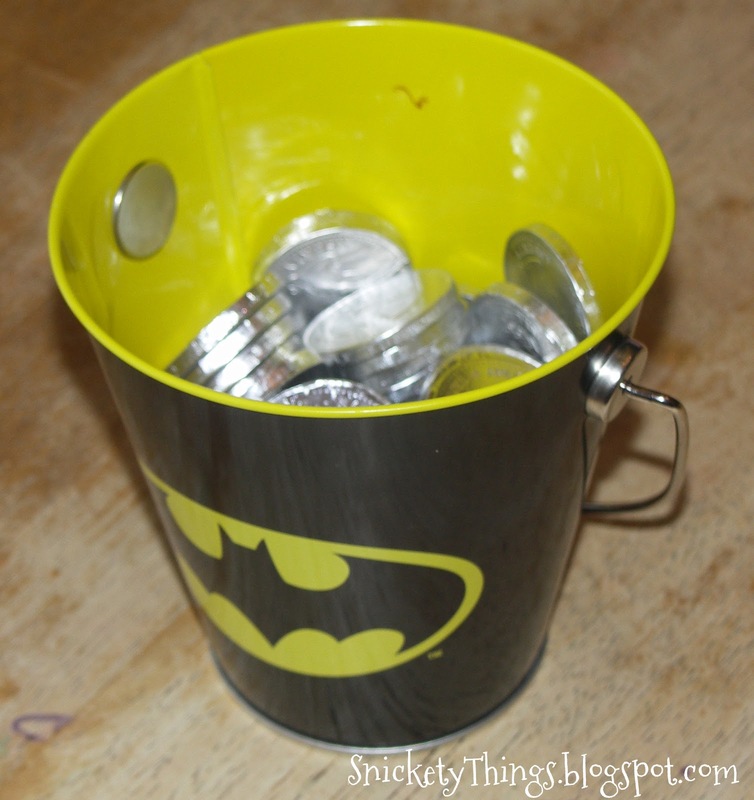 This morning he woke up to this Batman bucket filled with chocolate silver coins (they were in with the Star Wars coins). We were supposed to go out with family for lunch after church, but since we are all still sick, we are postponing that. He didn't want to spend money going out when he couldn't taste it. 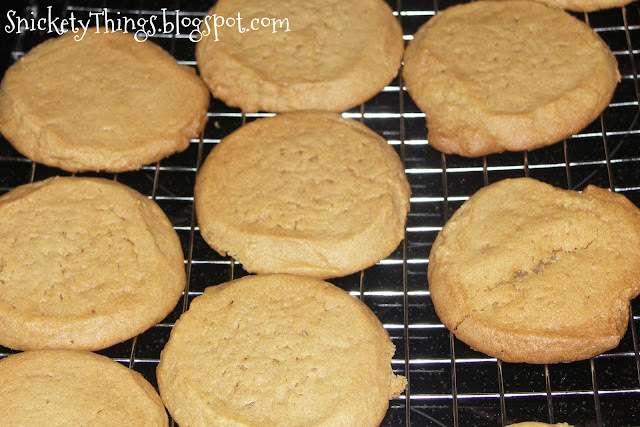 We did make his favorite cookies (peanut butter) after lunch to celebrate. I am going to have to do a big thing for him when we are all better. Happy 40th birthday Jeff! I love you! 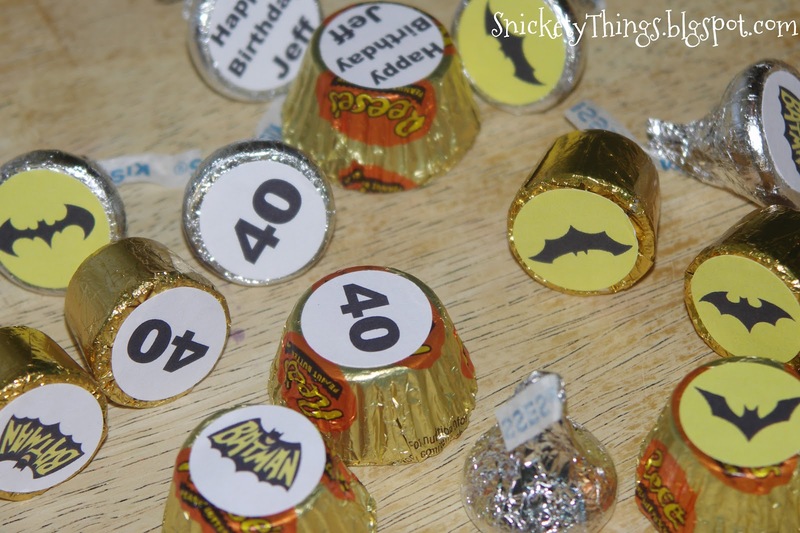 I love the stickers on candy idea. 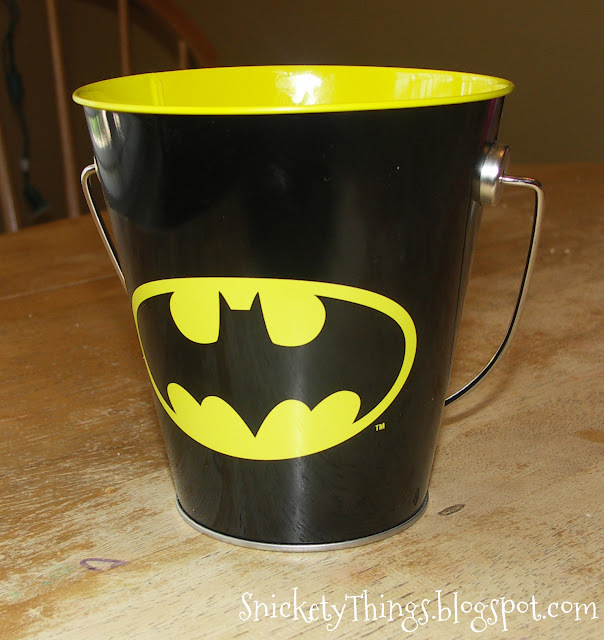 I am always looking for ideas to give the same number of gifts as the age of the recipient. It gets more difficult as the person gets older. Thanks. Thank you. I've seen that idea in a lot of different places so I can't claim it. It is really easy though. Hopefully, March will be a better month for you. I am so sorry for the loss of your friend. Thank you. She was a really sweet person and she will be missed.